Bart Simpson made the phrase “Eat my Shorts” famous in the early 90’s. My new little monkey friend decided to take this phrase literally on my recent trip to Bali and actually bit my shorts. Perhaps context is needed for this story. 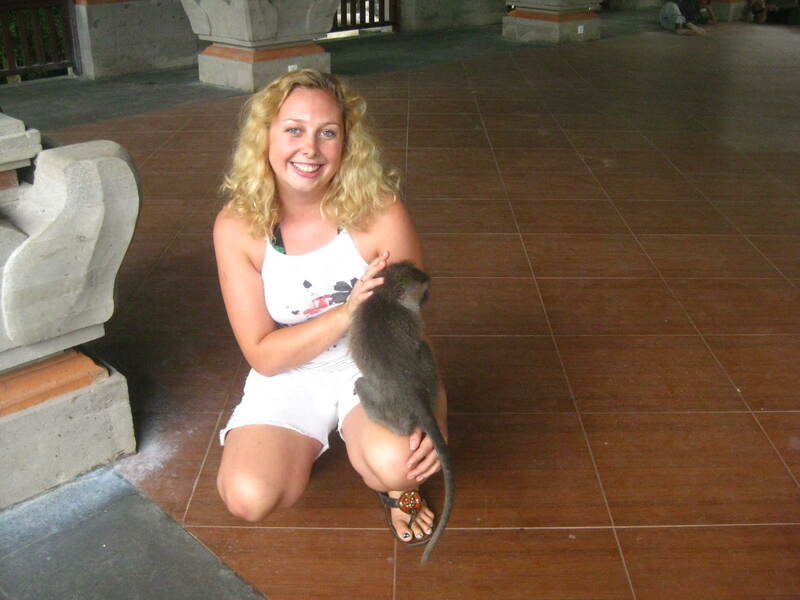 I was visiting the famous Monkey Temple in Ubud, Bali, Indonesia. Not only is this place famous for it’s monkeys and beautiful rainforests but also the naughtiness of these little buggers. Biting is common practice and theft is the norm. Beware your appendages as well as your belongings when visiting this place. I managed to have my leg climbed twice within two minutes of entering the forest. I was carrying bananas and I was unaware that these belonged to Mr. Large Monkey. He walked right over and demanded them back. I gave him one to appease him and tried to share them with monkeys inside. But no, Mr Large Monkey would have none of it. He decided to climb my leg and grab another. The guide nearby gave me the advice to place the bananas’ under my shirt so he wouldn’t see them. Ah clever thinking, if one were around say dolphins who cannot climb! Mr Large Monkey saw clothing as no obstacle to what was rightfully his. He climbed my leg once again and reached under my shirt. I tried to tell him that this was inappropriate behaviour but he made a very valid point by baring his teeth. I argued no more and surrendered his precious goods. Lesson #1: The banana’s are Mr Large Monkey’s. Do not try and keep them from him, he knows where they are and he is not afraid to strip search you to get them. 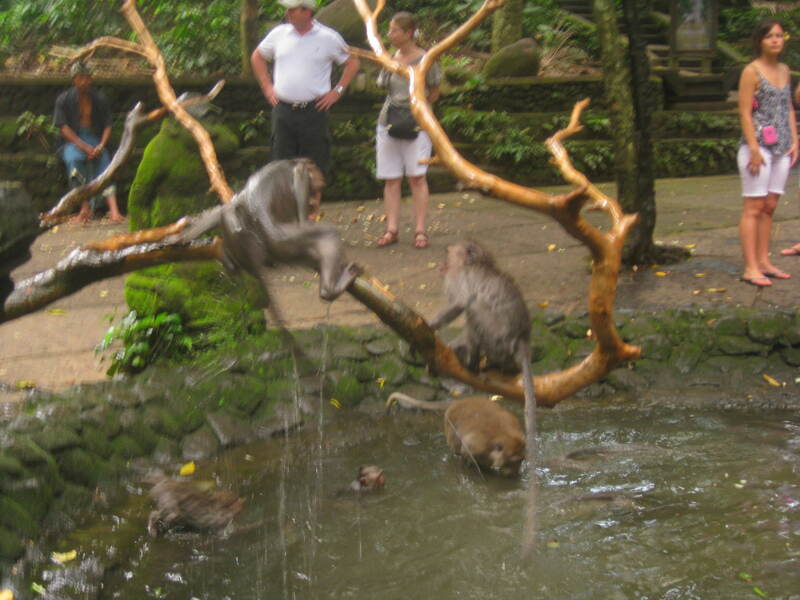 So we make it inside to the Monkey bathing pool where the monkeys are going, well, ape! Climbing onto statues and branches and leaping into the pool. Pulling one another’s tail and wrestling in the water appears to be the aim of the game. No one wins, everyone has a go and a whole lot of noise is made. I approach the pool to get a closer photo of their antics. I managed to stay an appropriate distance away so as not to get splashed by the leaps and bounds of the semi drowned fuzz balls . One very cheeky monkey thought he would outsmart me by leaping up into the tree beside me, finding a suitable place to perch on a branch and shaking himself dry to shower me with the mucky play water. 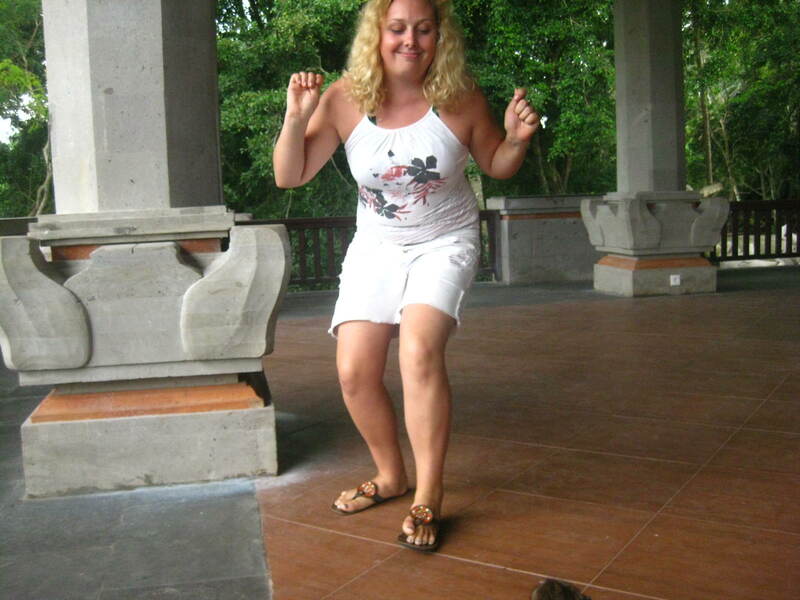 Lesson #2: You can never be too careful around monkeys. Always be on the lookout and remember that they can climb above you. If they want to do something, they will do it. Oh and wet monkeys are cheekier then dry monkeys. Something in the water maybe? We proceeded on cautiously to the temple and ritual area. This was quieter with less tourists and more sculptures and artworks in stone. 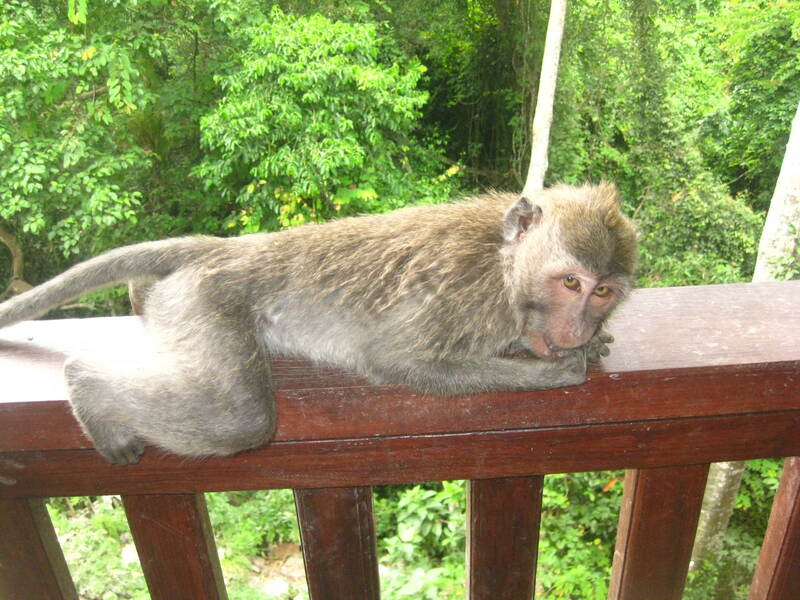 As we stood in the grand Balae overlooking the forest, a tired and fed up monkey collapsed on the banister in front of us. After much cooing and awing from myself and a few other tourists he lifted his head, sighed and rested on the railing once again. The poor little tyke had obviously had a big day and was tired of tourists. 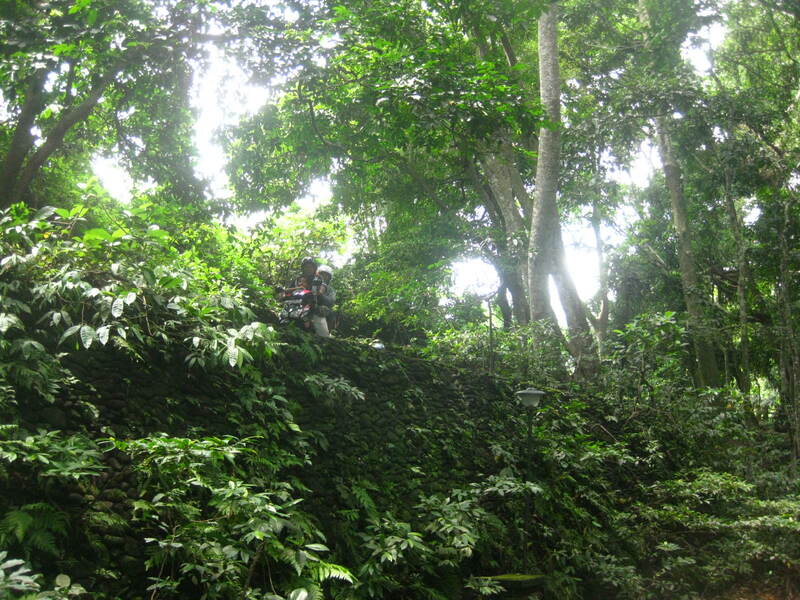 My guide reached out to him and the monkey gratefully took the helping hand. Happy to have a friend. Again my guide reached for him and this time the monkey sat up to inspect. After gaining trust my guide allowed the monkey on his shoulder. Due to my initial close encounter at the front gate, I was a little apprehensive to get so close and decided taking photos was best. 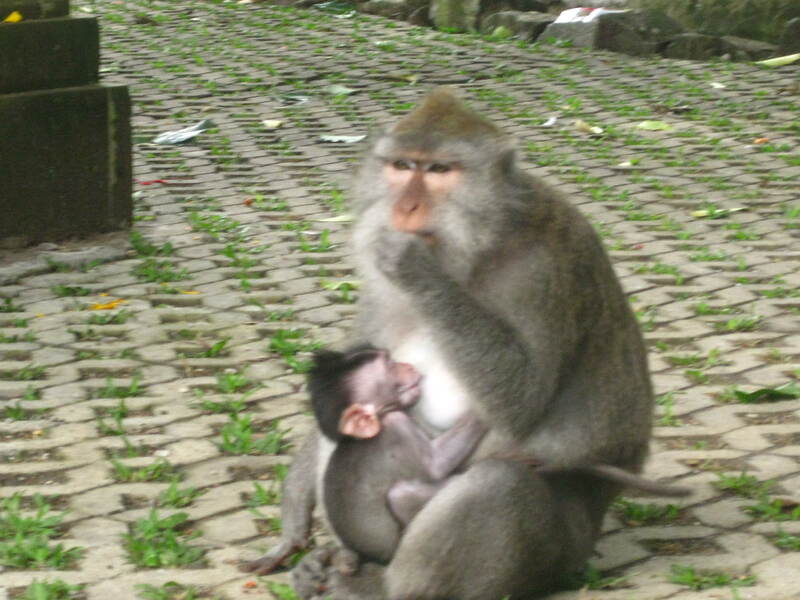 My guide however, insisted that I get close to little Mr Woeful monkey and allow him to climb on me. After much hesitation I crouched down to the forlorn little monkey and allowed him to hold my hand and inspect my ring, He then jumped on my knee after an encouraging pat. So sweet. He then began to play with the strings on my shorts and just as I was giggling away at his curiosity.. crunch!!! Little bugger decided to take a bite and see what flavour I was. I leapt away and he leapt back and bared his teeth in a defensive stance. Hello!! YOU JUST BIT ME! Should I not be the defensive one? Well I was! I grabbed my guide and thrust him in front of me, using him as a human shield as Mr Woeful monkey followed me round and round. When at a safe distance I managed to skip away watching then ever closely for the naughty little Bart Simpson who ate my shorts. Lesson #3: As cute, sweet and innocent as a monkey may look, remember, they are not. They are cheeky little buggers and they will bite if you do something to upset them. Shorts may contain food and if they believe this, they will try to eat them. Don’t trust anyone! Or any monkey! Best way to get there is by hiring a guide and doing a full day tour.